Yesterday GoPro Fusion (reviewed here) finally got an update to add overcapture capability to its Android app. 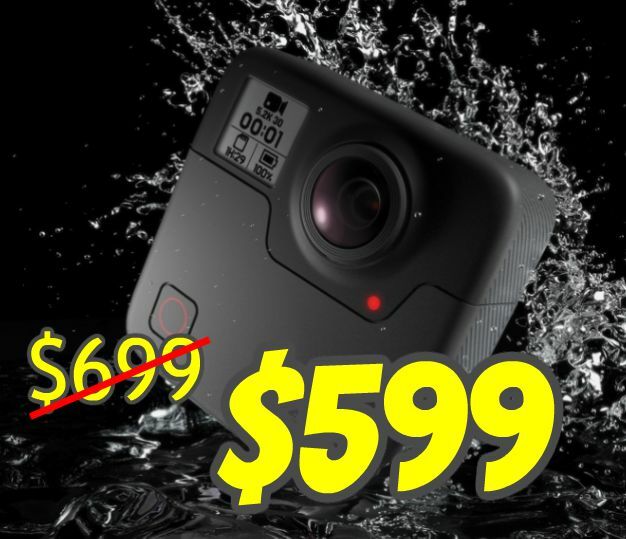 At the same time, it launched a new promo today where you can save $100 on a GoPro Fusion. But there’s an even better deal that they’re not talking about. During CES 2018, I met up with 360 Rumors reader and friend Bill Strehl, and at one point, he asked me which 360 camera I thought was the best. After pondering a bit, I said the GoPro Fusion. That was back in January, before I conducted my own comparison against the Insta360 Pro, which frankly surprised me, because I found that the Fusion got very close to the video quality of the Insta360 Pro. 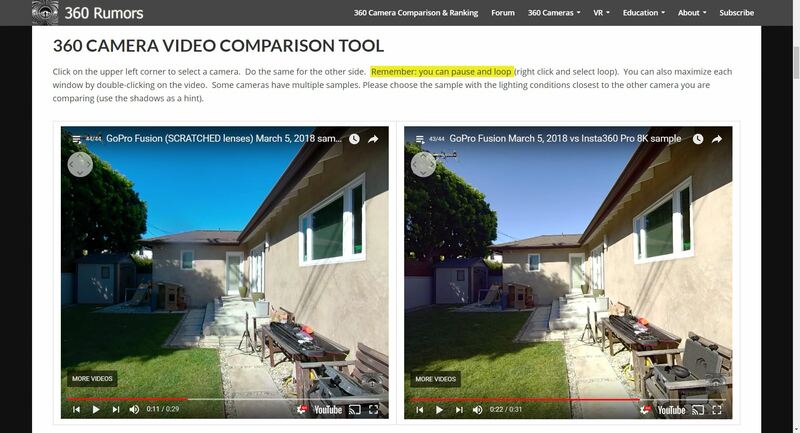 (Don’t take my word for it — check the 360 Camera Comparison Tool.) That is one of the reasons I became an even bigger fan of the Fusion. And as you saw recently, its stabilization is actually more or less tied with Rylo for best stabilization. Fusion (left) is surprisingly almost as good as Insta360 Pro (right) — note that this Fusion has scratched lenses. With excellent video quality, excellent stabilization, and nearly excellent photo quality (just having a bit less detail than Xiaomi), you would think that everyone looking for a 360 camera would be choosing the GoPro Fusion. But that hasn’t happened. One reason had been the objection that its Android app was flawed and could not produce overcapture videos. That objection went away yesterday when GoPro released an update to the Android app that added overcapture. Another reason had been the price. At $699, it’s still one of the more expensive 360 cameras. But if the video quality is almost as good as the $3,499 Insta360 Pro, wouldn’t that make it an amazing value? That’s my opinion, anyway. In any case, GoPro just announced a new promo where you could trade in a digital camera (GoPro or otherwise) and get $100 off the Fusion. The camera doesn’t have to be in working condition. The only requirement is that it must have had an original value of $99.99 or more. Yes even beat up, nonfunctioning, ancient digital cameras will qualify…! But before you jump on that deal, there’s an even better deal available. You see, there’s another objection to the Fusion, which is that it’s waterproof but it’s NOT rugged — it doesn’t have a replaceable lens, nor does it have an external housing. If you drop it or scratch it, your investment is done for. The solution is to get a protection plan that will replace your Fusion if it’s damaged. Conveniently, GoPro does have a protection plan, and it only costs $5 a month. Sounds tempting… until you do the math, which comes up to $60 per year. Still tolerable. But here’s the kicker: on top of the plan’s cost, there’s a deductible of $140. Meanwhile, if you buy the Fusion from Amazon, you can get a protection plan for around $53. That’s a one-time payment, not an annual fee, and it’s good for 4 years. And it has zero deductible. So, while Fusion’s promo decreases the upfront cost, the lower total cost is actually from Amazon. Even if you never have to use the protection plan, you’ll come out ahead. At the end of 4 yrs, you will have saved $87. And if you have to use the protection plan, you’ll save an additional $140 (total of $227). And if you don’t mind an open box Fusion, you can get them from Amazon for around $585, which adds another $114 or so of savings. I realize that all these costs do add up, which is why another camera you can consider is the Yi 360 VR ($399; reviewed here), which I found to have the second best video quality, noticeably better than all other cameras except the Fusion. But please note that the Yi 360 VR does not have a stitcher for Mac. Thank you very much to Bill Strehl for bringing this deal to my attention! I went with GoPro 5 bucks a month because the reviews on the Amazon protection plans seem really mixed. I have always been afraid to buy them because so many reviewers say its a scam. Anyone use any of the protection plans on Amazon and had to make a claim? Seems like i got a very good deal through gopro when i ordered mine. Took advantage of their trade up offer by ordering an old broken gopro off ebay and somehow got $200 off. $559.49 after tax.